Since her death, the relics of St Waltrude have always been kept in Mons, except from 1794 to 1803. During this period, the canonesses were exiled to Germany and took the relics with them, fearing that the revolutionary soldiers would seize them. Since 1250, the head and body of the saint have been placed in two different reliquaries, in order to facilitate access for the faithful. This refers to the reliquary that contains the head of Saint Waltrude. It was initially preserved in a reliquary gifted by Margaret of Constantinople, the then-Countess of Hainaut. However, in 1794, this reliquary disappeared. The one currently seen in the Collegiate Church dates back to 1867, and was created by the Bourdon goldsmith of Ghent. Designed in the neo-Gothic style and made from silver and brass in the form of a canopy, it is decorated with colourful stones and cabochon. It replaced the simple wooden reliquary from 1804. The shrine houses the body of St Waltrude. Her relics were kept in different shrines over the years. Nowadays, the shrine housing the relics shares the same neo-Gothic style as the head reliquary. This shrine, which dates back to 1887, is made from gilded brass decorated with precious and semi-precious stones, enamel and cabochon. It was designed by J Wilmotte, a Liege-based goldsmith. Reminiscent of the shape of a church, it displays important figures: Christ and the Virgin and Child (on the cogwheels), St Waltrude accompanied by her daughters on one side, and St Vincent and his sons on the other, with each group surrounded by six apostles (along the two sides). The shrine currently dominates the choir of the Collegiate Church, suspended above the high altar, where it awaits to be brought down the Saturday before Trinity Sunday and placed on the Golden Chariot. On the Saturday, the Collegiate Church gradually fills up, until it is filled to the rafters by the evening. This is the moment the patron saint of Mons is brought back among the mortals. 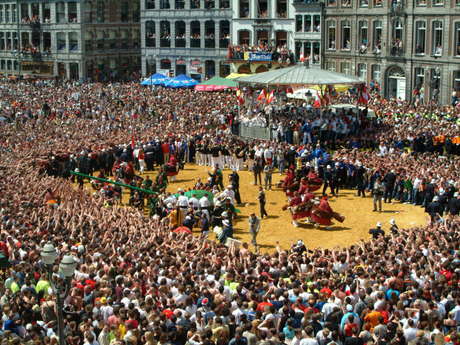 It is a key moment of the weekend, marking, as it were, the commencement of the Doudou, the traditional festival of Mons. A long-awaited but solemn moment, this ritual is carried out while the emotional crowd look on. At around 8pm, the first notes of the trumpets, timbales and organ ring out. A procession featuring the “canonesses” of St Waltrude then begins its journey from the sacristy. The shrine begins its descent to the sound of Fortem virili pectore. The burgomaster is present and the dean entrusts him with the duty of watching over the shrine during the procession the next day. While waiting, the public has the privilege of being able to touch the reliquary, which has remained an object of worship. At this stage of the ceremony, the “Air du Doudou” sounds out, played on the organ and echoed in unison by the spectators and the entire city.